IITA-Zambia hosted a visit by a high-level Swiss delegation led by His Excellency Mr Arthur Mattli, Swiss Ambassador to Zambia and the East Africa Region, on 29 November. He was accompanied by a team from the Swiss Development Cooperation (SDC) Office for Southern Africa based at the Embassy of Switzerland in Harare, Zimbabwe composed of Ms Brigitte Oederlin, Deputy Director, SDC, and Mr Bulisani L. Ncube, Senior Regional Programme Officer, Food Security, and Agriculture Program, SDC. David Chikoye with other Southern Africa Hub colleagues briefing the Swiss delegation. 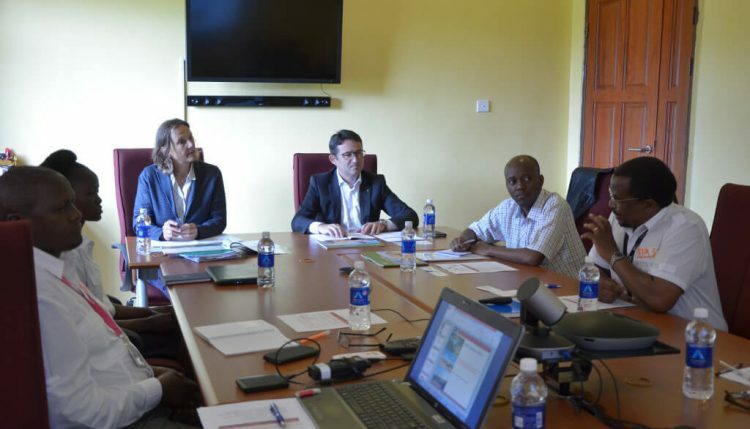 The Swiss delegation was received by IITA-Zambia scientists and staff led by David Chikoye, IITA Regional Director for Southern Africa, as well as members of the Zambia Youth Agripreneurs (ZYA). The visit was intended to familiarize the SDC with IITA’s activities and projects in the region, particularly in areas related to SDC’s policies such as improving household nutrition, water management, climate-smart agriculture/climate services for agriculture, and youth involvement. “First, I would like to congratulate IITA on your 50th anniversary. There are but a few international research centers in the world that have reached this milestone,” said Ambassador Mattli at the start of the visit. “This visit is part of the SDC’s multi-country exploratory mission in southern Africa to see how we can work with partners in the region in the context of our Food Security and Agriculture Program,” he explained. “We wanted to know what IITA could offer with regard to these priority thematic areas,” Ms Oederlin reiterated, briefly summarizing the objective of their visit. 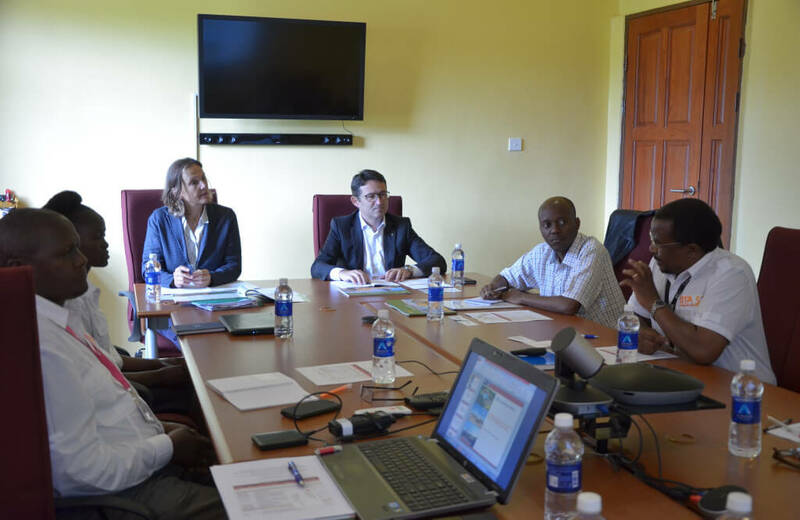 In response, Chikoye briefed the Swiss delegation on IITA’s past and ongoing research activities and projects in the region, specifically relating them to SDC’s identified priority areas. “We have a strong portfolio of projects and programs in southern Africa that fits perfectly with SDC’s policies,” he said. He expounded on this by making a presentation about IITA and our work in the region, which was supplemented by presentations by Pheneas Ntawuruhunga (on soybean and cassava research), Juliet Akello (on nutrition and food safety), and Cynthia Chibebe (on the Zambia Youth Agripreneurs program). The Q&A that followed the presentations raised some very important focal areas on which to establish a possible formal partnership between IITA and SDC. These included mitigating climate-induced shocks to farmers through agricultural interventions, seed systems, food and nutrition science, food safety, and gender and youth in agriculture and agribusiness. After the discussions, the Swiss delegation were given a tour of the SARAH campus, during which they were shown the cassava field trials, mechanized irrigation system, and the ZYA-operated cassava processing center and vegetable plots. At the end of the visit, Ambassador Mattli handed Chikoye a symbolic parting gift—a pen. “On behalf of the Swiss Embassy and the SDC, I would like to thank you, your staff, and the youth for hosting us here today. We learned a lot about IITA and the good work that you are doing in the region. Please receive this pen as a symbol of our future partnership and we look forward to signing many agreements between IITA and the SDC,” he concluded.